This is a compilation of great footage from Michael Landau's 4/20/07 show at the Spirit of 66 in Verviers Belgium. Great stuff. Here's the official music video for Steve Lukather's new single "Ever Changing Times." Scott Henderson will be touring Europe this spring with John Humphrey on bass, and Alan Hertz on drums. Confirmed dates and locations are below. 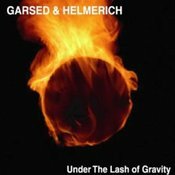 Garsed & Helmerich's "Under The Lash of Gravity" now available for download! Great news! Brett Garsed and T.J. Helmerich's long out-of-print album Under The Lash of Gravity is now available for download through Amazon.com. You can download individual tracks for .99 cents each, or the whole album for $8.99. The tracks are encoded as 256kbps MP3's. Guitar legend Allan Holdsworth is in a class by himself. Not just as a guitarist, but as a composer and improviser as well. His unique brand of instrumental jazz-fusion is highlighted by his one-of-a-kind chord voicings, his otherworldly legato technique, and an improvising vocabulary that is wholly his own. Though he's never attained as much mainstream attention as, say, John McLaughlin, many "in the know" musicians consider Holdsworth to be, pound-for-pound, the best guitar player in the world today. I had seen Holdsworth live a couple of times in the past, but seeing his gig at the small Baked Potato jazz club in Studio City California on 1/18/08 provided a completely new experience for me. Joined by long-time band mates Jimmy Johnson on bass, and Chad Wackerman on drums, Holdsworth seemed more relaxed and jovial than the previous times I've seen him play. Perhaps this was due to the small size of the room, or the fact it was the second show of the night. Whatever the reason, the notoriously self-deprecating Holdsworth was in great spirits for this performance. For this gig, Holdsworth used his main Bill DeLap headless guitar through some Hughes & Kettner amps. He had two KORG volume pedals on the floor, but he did most of his effects switching by hand, as his main effects board was sitting near the club's mixing console right next to him about waist high. The Baked Potato is so small, you could hear the click clear across the room when Holdsworth would reach over and push the switch on one of his pedals. All three musicians played magnificently throughout the entire set, but the fun these guys were having struck me almost as much as the music did. For example - at one point in the show, after Johnson took an emotional solo with his head swaying back and forth, Holdsworth playfully mocked him by putting on his best "over the top" guitar solo face. He then made the crowd crack up by starting his solo with a blues bend (!). It's the most basic guitar solo move in the world, but Holdsworth never does it, which is why it was so funny. The set featured several "oldies but goodies" including "Fred" from the Tony Williams New Lifetime Believe It album (one of Holdsworth's best recordings for the '70s). I've always loved the contrast of slow-moving chords over a quick groove in this song. Not surprisingly, Holdsworth 's solo on this tune was unreal. Another memorable song was the Metal Fatigue classic "Devil Take The Hindmost." In the middle of the guitar solo, Johnson dropped out completely and Holdsworth unleashed an atonal "sheets of sound" barrage, with Wackerman wailing away underneath. After maybe 45 seconds of this onslaught, Johnson and Wackerman relaunched the solo section's G minor groove, and Holdsworth fell right back in step with them. It was a great moment that induced a triumphant cheer from the crowd. Johnson and Wackerman really stood out on this tune, as well as their showcase piece "Water On The Brain." After their "final" song, Holdsworth and Wackerman stood by the bar, and Johnson returned to his seat (which happened to be right behind me). After a couple of minutes, they took the stage once more for the real final song - "Red Alert" (another staple from the Believe It album). This is a perfect encore tune for this group. It's a fun, heavy riff that most Holdsworth fans are familiar with, and it gives the guitar icon a chance to really blow. This is not a song Holdsworth was playing live until the recent Tony Williams tribute shows with keyboardist Alan Pasqua (Pasqua also played on the Believe It album). Those shows must have rekindled Holdsworth's interest in the tune, as Holdsworth's band closes with "Red Alert" quite often now. The song works well for the trio format too; I loved the way Johnson emulated the keyboard parts from the original recording. 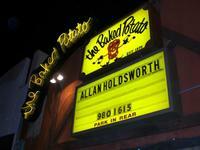 I've concluded a small, intimate club such as The Baked Potato is the ideal venue to see a Holdsworth show. Seeing his incredible solos up close and personal was really something. Holdsworth will be touring the east coast and Europe this spring with Wackerman and Johnson. Check them out if you can. 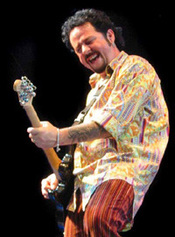 All Out Guitar has a great interview up with Steve Lukather. One of the best shows I attended when I was in the L.A. area for the NAMM show was Brett Garsed & Dirty Martini (Ric Fierabracci - bass, Joel Taylor - drums) at Alva's on January 19th. I know this show was recorded, and I've been hoping some live tracks from this great gig would eventually emerge. Lo and behold, Garsed has posted a live version of his song "Undoing" from the Alva's show on his MySpace page. Also, Garsed posted a second live track, simply called "SlideSoloDirtyMartiniTrio," which is actually from the band's awesome cover of John Scofield's "Sticks And Stones" from the same Alva's show. FYI - the photo Garsed has in the MySpace music player for these tracks was taken by yours truly. Thanks to Laurie from Truth In Shredding for spotting this one. It's Jeff Kollman at the Baked Potato with Virgil Donati on drums and J.K. Kleutgens on bass, and "Hanz" on keys playing "5 for Eddie."